The most popular sports car in America is the Porsche. Okay, maybe it’s not the most popular, but it’s the sexiest! Seriously, your Porsche makes you the envy of all your neighbors. You probably get a lot of requests for rides in your Porsche because everyone knows it’s the best driving experience in town. But hold up, pump the brakes. It’s only going to be a great driving experience if qualified technicians have made it road-ready. Where do you find these qualified technicians? Rocco’s European Garage in Marietta, GA to start! We’ll make sure your Porsche is at peak performance with an effective service plan. Our goal is help you avoid costly Porsche repairs with our maintenance schedules, which includes oil changes, tune-ups, filter changes, fluid services, diagnostic services, maintenance inspections, and tire services. We use state-of-the-art tools and equipment to diagnose, inspect, service, and repair all models of Porsche. Keep your Porsche in the fast lane by visiting our full-service Porsche repair facility. It’s possible to drive your vehicle with complete confidence in its performance and longevity. All we need is your Porsche and your trust. We’ll handle the rest! A routine maintenance schedule gives us the opportunity to thoroughly analyze your vehicle’s systems–engine, mechanical, electrical. We’ll provide exceptional Porsche repair services that you can trust. Feel free to come to us for a second or third opinion before receiving any expensive Porsche repairs. Our ASE Certified technicians specialize in all services for your Porsche, including engine repairs and replacements, transmission repairs and rebuilds, brake repairs, wheel alignments, exhaust system repairs, A/C repairs, check engine light repairs, and more. We stand behind all of our Porsche repairs with a competitive service guarantee–12 Months / 12,000 Mile Warranty. Find out the truth from our techs every time! Our Porsche service experts have been providing the Atlanta and Marietta, GA areas with top-notch Porsche repair and maintenance for years. Our reputation precedes us, just ask around. You’re sure to find a fellow Porsche driver who can vouch for the top quality services we provide. With advanced diagnostic technologies and service techniques, your Porsche will stay road-ready, whether you’re heading for the racetrack or the highway. Come to our full-service Porsche repair facility located on Sandy Plains Road. We use the industry’s most advanced diagnostic equipment to perform all of your Porsche’s services. Give us a call today at 770-795-7575 to schedule your next service appointment. You can save time by using our convenient online scheduling system. 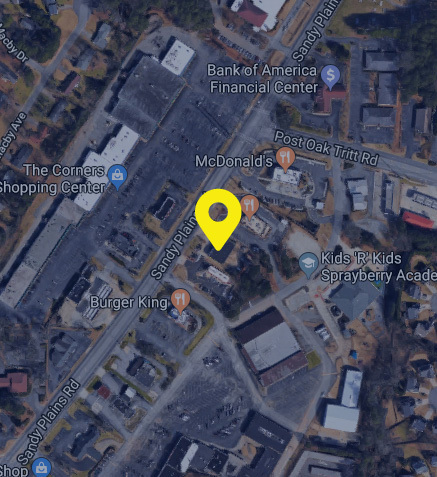 Next time you’re in the area–2746 Sandy Plains Road–feel free to stop by with any questions or concerns.